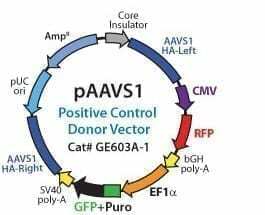 When you want a positive control to validate AAVS1 genomic locus targeting or if you’d like to make fluorescently labeled cells with RFP expressed from the AAVS1 site, use this ready-to-transfect first generation pAAVS1D-CMV-RFP-EF1α-copGFPpuro PrecisionX HR Targeting Vector. To insert RFP at the AAVS1 site, simply co-transfect with Cas9 and gRNA delivery constructs, such as our All-in-one Cas9 SmartNuclease & AAVS1 gRNA Plasmid. The pAAVS1D-CMV-RFP-EF1α-copGFPpuro AAVS1 HR Targeting Vector is ready-to-transfect, with RFP driven by the strong CMV promoter. This vector also features dual GFP and Puromycin-resistance markers driven by a constitutive EF1α promoter, enabling easy monitoring of successful recombination by GFP fluorescence, as well as rapid selection for integration using the puromycin antibiotic marker.